My sermon from Second Sunday in Lent (February 25, 2018) on Mark 8:31-38. Listen to the recording below or read my manuscript below. And here it is….today. Well, some of it at least. As you can see, this part is mostly ruins. But the cave there is the reason why Caesarea Philippi existed in the first place. That cave marks the location of a deep freshwater spring that still works today. Water flows out of the bedrock in the cave, down the hill, and into what eventually becomes the Jordan River. This next picture gives us an idea of how lush and green the area actually was. It’s beautiful and sort of just pops out as an oasis in the middle of the wilderness. In fact, a temple to the god Pan, the god of “desolate places,” was built there. Now, over time, the area became more important and King Herod’s son, Philip II, decided to build a city there. He named the city Caesarea in honor of the Roman Emperor, Caesar Augustus. As the city grew, the local rulers tried to make the city as Roman as possible. They built theaters, markets, and even a temple dedicated to the Roman emperors. The hillside, as you can see, became a holy place filled with the images of Roman gods, Roman Emperors, and other symbols of the Roman Empire. The Roman values of power – power through conquest, control, and violence was honored and celebrated there. 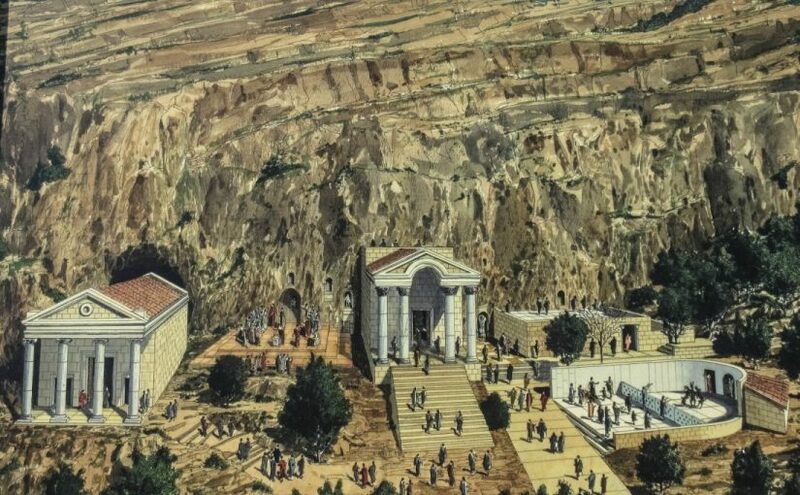 The city of Caesarea Philippi made a specific claim that Rome was all that mattered. And it’s in that place, in the shadow of the Roman temples and Roman statues that Jesus does a very strange thing: he rebukes the power that he sees. Rome didn’t believe in suffering; it believed in making other people suffer. That’s what power, to them, looked like. Yet Jesus makes a promise to his disciples, to us, and to the world that what will truly make a difference is a power that doesn’t, on its surface, look like power at all.